Terre Haute, Ind. 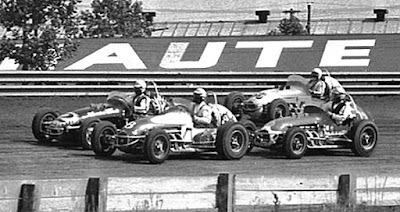 (June 16, 1963) – Roger McCluskey trounced one of the fastest fields ever assembled in sprint car history in a thrilling 30-lap feature on the Vigo County Fairgrounds’ half-mile dirt. McCluskey’s time of 12 minutes and 14.25 seconds set a new record for 15 miles. He took the checkers two seconds ahead of pole winner Chuck Hulse. A.J. Foyt brought his new Leader Card 255 Offy and brought it home in third place. Steve Stapp drove to a best-ever fourth place finish and Don Branson rounded out the top five. It was a day of records at the “Action Track” as one-lap, eight-lap and 30-lap marks were set. The most important record to the drivers, however, was the record purse of $10,965. McCluskey’s winning share was $2,422. Attendance was 7,500 paid and with children admitted free, the total was well over 11,000. Qualifications proved interesting with Chuck Hulse first out to qualify and setting a new one-lap record of 23.44 seconds besting the old mark of 23.60 set by McCluskey. Then McCluskey took his turn and tried to regain the record and clocked a 23.46. After sweating out 18 cars, Hulse was about ready to collect his $25 for fast time when Stapp turned in 23.42, which not only stunned the fans in attendance but the other drivers. Hulse got his name in the record books by winning the eight-lap first heat in the record time of 3 minutes and 9.52 seconds. That record beat the five-year-old mark of 3 minutes and 16.20 seconds held by Jim McWithey. In addition to Hulse winning his heat, Jim Hurtubise and Jim Miller would score heat wins as well. Jiggs Peters was the semi-main winner.